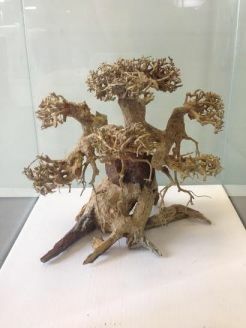 Are you looking for the perfect piece of wood to create an underwater tree for your next aquascape? Then look to further...Bonsai Tree Driftwood is perfect for creating under water tree aquascapes. Each piece is hand made and of extremely high quality. The detail and intricacy of each piece will help you create a truly stunning and natural looking tree scape. Each piece varies in size and shape. The picture is an example of what we send out. The average size is between 20-25cm high and 22-28cm wide. Suits aquaria ranging from 50-100 liters. You will need to soak each piece of bonsai wood for 7 days to make it sink. Please bear this is mind when ordering.